Nineteen people were killed in a plane crash in South Sudan Sunday, officials said. 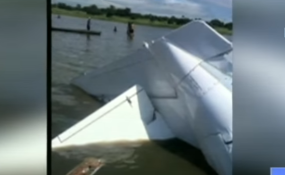 At least 22 people were aboard the flight from the capital Juba's international airport to the city of Yirol when it crashed. An Italian citizen working with a non-profit was identified as one of the survivors, and was reported to be in stable condition after being flown back to Juba. Several crashes have occurred in war-torn South Sudan in recent years. In 2017, four passengers were injured when a plane crashed into a truck trying to land in the city of Wau amid bad weather. In 2015, 36 people were killed when a Russian-built cargo plane with passengers crashed shortly after taking off from Juba.